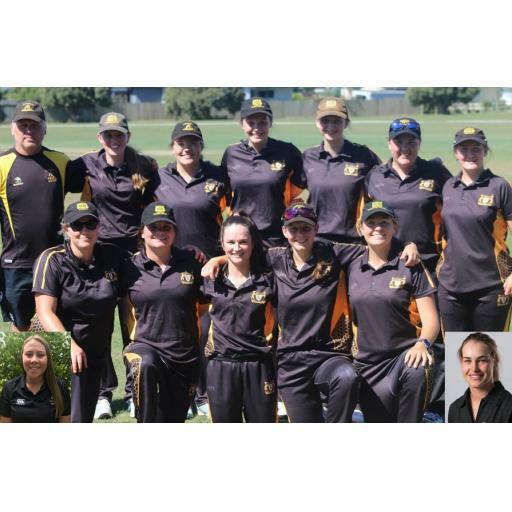 The Taranaki Women’s team successfully defended the T20 trophy last weekend for the second year running. Up against Hawkes Bay in game one they loss the toss and batted first. Taranaki posted 131 for 6 with our CD Hinds reps Natalie Dodd (46) and Kate Baxter (24) top scoring, the two putting on a 70 run partnership for the 3rd wicket. In reply Hawkes Bay started steadily but some tight and effective bowling from Kelsey Husband (3-16) and Emily Cunningham (2-5) helped restrict them to 89 for 8 from their 20 overs. The afternoon game versus Nelson was played on a pitch where teams scored less than 50 in the previous game, Taranaki won the toss & elected to bat, a decision they immediately regretted when both openers Natalie Dodd & Aimee Watkins were out cheaply, 13-2. Emily Cunningham (10) & Taila Hurley (15) fought hard for runs but when both were out with the score at 42-4 after 11 overs things didn’t improve with Taranaki being all out for 63 in the 18th over. Taranaki struck early with Kate Baxter & Emily Cunningham picking up a wicket each. However Nelson made it through to 64 with the loss of only 1 more wicket with 5 overs to spare. In the final pool game Taranaki went head to head with Manawatu. With 4 teams all having won one and lost one, it was important to win this game & improve our Net Run rate to have a chance to make the final. Taranaki won the toss & asked Manawatu to bat. Manawatu would post 124 for 5 from their 20 overs, Aimee Watkins 3-3 the main contributor in restricting Manawatu to what was a still competitive total, she was assisted by Kelsey Husband 2-22. In order for Taranaki to make the final they would have to score the runs and score them quickly, with the pressure on Taranaki lost an early wicket which saw Aimee Watkins joined Natalie Dodd at the crease. Watkins showed why she was one of the best players in the world when playing for the White Ferns with a hard hit 66 off just 30 balls, the innings along with Dodd finishing 33 not out allowed Taranaki to complete a resounding victory in the 15th over. The win was enough to see the girls through to the final. In the final they came up against a strong Wairarapa side, Taranaki won the toss & chose to bat & made it through to 22 before they lost wickets regularly & at 49-5 after 12 overs were in a bit of trouble. A 6th wicket partnership of 46 between Shannen Elliott & Aimee Wisnewskisaw them through to 95 for 6. Taranaki finished 108 for 6 with Elliott finishing 42 not out. Wairarapa innings was very similar to Taranaki’s with them making it through to 17 before losing their first wicket. They then lost wickets frequently & at 36-6 after 7 overs Taranaki had the momentum. A 6th wicket partnership of 34, which swung the game back Wairarapa's way was broken by Caitlin O’Sullivan's first ball of the match. Wairarapa were eventually all out for 78 in the 16th over giving Taranaki the win by 30 runs. Aimee Watkins 3 for 17, Taila Hurley 2 for 8 and Kelsey Husband 2 for 31. A great way to end what has been a frustrating season, dominated by rainouts.